The popular McDonald’s Monopoly Game is renowned for offering prizes and passes into the world’s best attractions and activities. 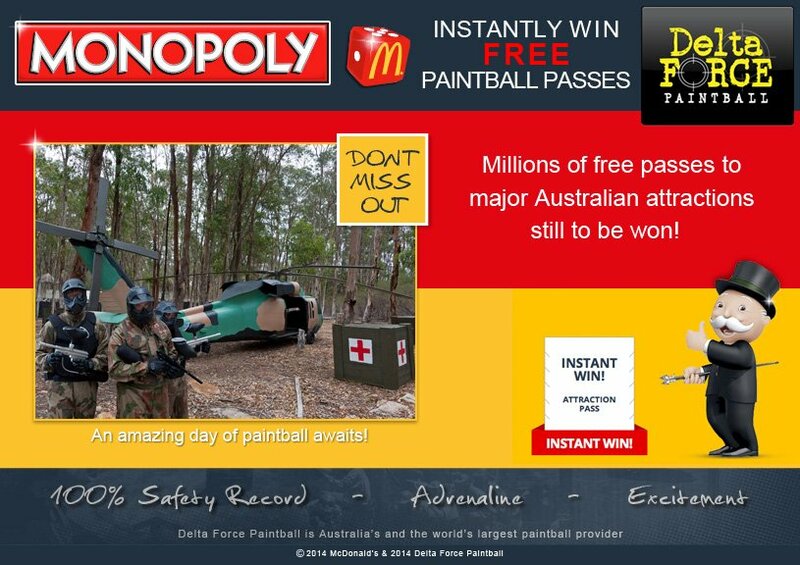 As such, when the world’s largest fast food chain wanted to add the excitement of paintball to their giveaway list, it was the world’s largest paintball provider Delta Force Paintball that they approached. And we were happy to accept and add our special brand of high energy, exhilarating outdoor paintball games to the prize pool. 1000’s of lucky customers have already won free passes and come and played at one of our professionally run centres. Don’t miss out! Win your free pass at a McDonald’s restaurant anywhere in Australia. Dads, mums, girls, boys, grandfathers and grandmothers have all won and played already. Win at Maccas and book in to see why those before you always leave with massive smiles, vowing to return to play again soon.